The main feature of Cuntis is its Balneario and to be honest I do not think that the town warrants a separate visit unless you want to experience this Spa. (Use the index buttons to the right to find out more about the Spa.) That said, Cuntis is a perfectly normal town and if you are driving by and decide to call in, here is what you will find. Cuntis is not very big, but it does have a few nice buildings and a tree lined square adjacent to the entrance to its Balneario. 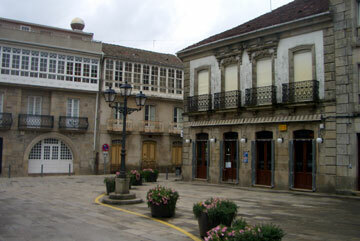 To one side of this plaza you will see a large stone church and to the other you will find the Spa hotel and an attractive street with a number of traditional Galician buildings lining it. Right, a small square in Cuntis close to the Spa. The remainder of the town is a mix of shops, businesses, houses and small apartment blocks. These are functional buildings and nothing more. There are a couple of cafes in the town and we have had a drink and a sandwich at one, all of which was very satisfactory with a more than friendly owner. As you move out of the main part of town you run into countryside with the odd house and small holding dotted around. 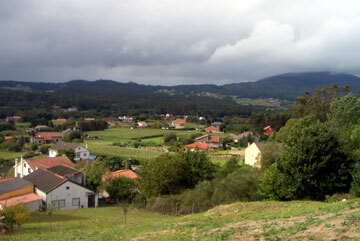 This is typical Galicia and the fields are a mix of grazing land and agricultural land. You will see fields of sweet corn, potatoes and other root crops, along with plenty of trees. 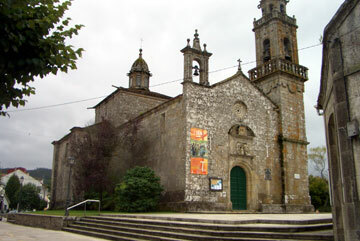 Left, a church, again close to the Balneario. Whilst in Cuntis we saw some signs for a Castro (the remains of an old Celtic settlement). We decided to follow the signs and walk up a hill that sits behind the town to see what was there. When we finally reach the archaeological site we were left positively unimpressed. There was a circle of barbed wire with what we assumed was part of a Castro within, however the whole area was overgrown and it looked like nobody bar ourselves had ever bothered to go and look at it. On the plus side however, the views looking across the scenic countryside did make the walk more than worthwhile, so we did not regret our decision to scale the hill. One other thing that I noticed when looking around Cuntis (whilst my wife was enjoying a therapy at the Spa), was a small stream that runs down one side of the town. All the way along this stream there were different exercise machines, all free to use. I think that the classification for this equipment type is inertia apparatus – where the design of the machine lets you exercise by using your own weight against yourself. In total there must have been about twenty different exercise appliances. Right, the scenery around the town as seen from the hill with the "less than impressive" Castros. So to summarise, I think that a visit to the Cuntis Balneario (Spa) is a great way to relax and fill part of a day if the weather is bad, or if you have spent too many days on the beach and want to try something a little bit different. If you do this, then take a walk around the town, or even have lunch at the Cuntis Balneario Hotel. The Spa is ideally located if you are in Pontevedra or even Vigo, and it only takes about an hour and ten minutes to reach from Santiago de Compostela. 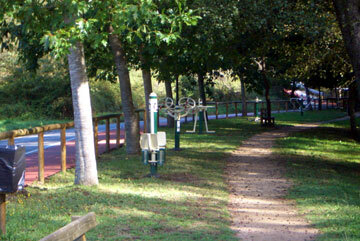 Left, the path by the stream with the numerous exercise machines. This went on for a couple of hundred metres.